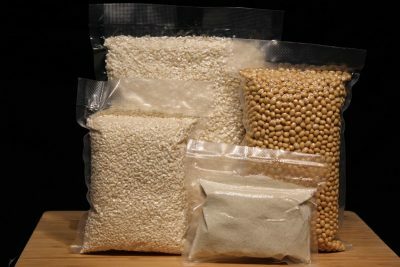 Miso Kit – Autoproduce your miso! 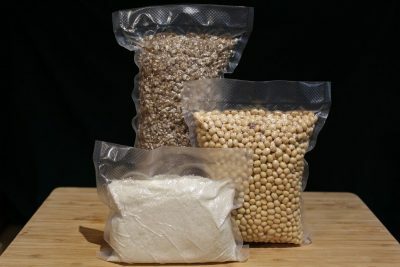 What is the Miso Kit ? The “Miso kits” are made to make your own miso at home! They are composed of Koji of rice or barley, soy and salt of Guérande. To make your Miso, just follow the recipe below or watch our video. 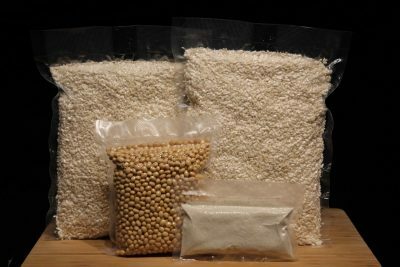 – 2 years for rice miso and barley miso. – 8 to 10 months for Shiro-Miso. The dates mentioned are indicative because Miso keeps well and has evolves, the tastes is refined and the colour becomes darker with time. The dose of ingredients in each miso kit is calculated according to a rate of salt, soy and Koji corresponding to the selected miso, it is important to keep this measure fully, it will allow the suitable conservation for the fermentation of your miso. How to make your miso at home ? Wash the soybean seeds and soak them in 3 times their volume of water for 12 hours. Cook soybeans at the pressure cooker for 1h or pan for 3 to 4h. The seeds are cooked when they are crushed between the fingers. In a bowl, mix the rice Koji with mineral water and wait 1 hour. Add the salt by mixing the ingredients well, then add the soy seeds. Grind the mixture with a mashed potato, a manual or electric chopper to obtain puree. Form balls the size of a tennis ball. Prepare an olive-type food pail or sandstone pot, place a food bag (optional) and put a layer of balls at the bottom, crushing them so as not to leave air. Make another floor and pack, start over until the end of the balls. Well flatten the top of your dough, spread two or three pinches of salt on it. Put a sheet of cellophane and a plate on the miso, then place a weight of 1kg on the plate. Store in a room between 15°C and 20°C. When your miso fermentation is complete (2 months for Shiro-miso and 6 months for rice or barley miso), remove any molds on top and keep cool for 2 years.